We should arrive in Hong Kong in 2 hours and it's been an interesting journey. Shanghai was a nice break from the rest of China. It's another high-tech bustling city with familiarities to home. The skyline of the Pudong area is shocking with nothing but skyscrapers piercing the clouds. We enjoyed our short stay, but nonetheless, we've been ready to leave China for some time now. It seems you either love it here, or your patience quickly runs out. Nicole can't seem to ignore the spitting and it's hard to escape the urban "small towns" of at least 2 million. The smoke filled cafes, trains and city streets make it difficult to find fresh air and we have joined locals coughing from the smoke and pollution. We took a day trip from Shanghai to Hangzhou to tour West Lake, the second most scenic tourist attraction for the Chinese. The 'little' town was filled with up-scale tourist restaurants and cafes. We first took the tourist bus to North Peak and scaled the mountain via the gondola. The smog/fog made it impossible to look back down over the lake and the temple atop the mountain was all under construction. Not a good day to visit and a small waste of money. Back down, we took the less expensive city bus half way around the man-made lake and walked across the causeways back to the train station. We had a great but expensive lunch at a little restaurant, stuffing ourselves. We were happy to walk it off. The lake was well laid out and beautiful for man-made nature. It was slightly chilly that day and being off season the crowds were small and we enjoyed chatting without having to walk single file. We arrived back in Shanghai after dark. It rained almost non-stop for our three days in Shanghai and we hadn't seen sunlight since arriving in China. We were both getting tired of it. 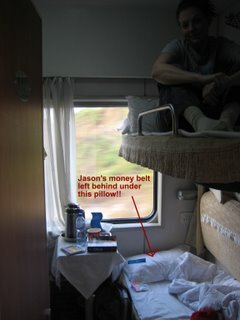 We left in the late afternoon taking a sleeper train to Guilin, our longest train yet at 21 hours. We weren't counting down the time to Guilin though, instead, 3 days to Hong Kong! From Guilin we took a bus to Yangshuo and were so happy to find beautiful scenery and fellow backpackers looking to escape the cities. Our hostel in Yangshuo was great, $11 each for the night which included three meals. We ate a wonderful dinner with a dozen other travellers and chatted with a nice English couple well into the evening. We made plans for a trek the next day and for the first time found ourselves disappointed that we didn't have more time to discover the area. Early the next morning we met Susy and Tim and headed out for a 5 hour trek along the Li River lined with beautiful peaked hills. We weaved through farms, tiny villages and along the river, crossing it three times via local boat. All 4 of us were thrilled to be off the beaten track and amongst smiling locals not looking for our money. That evening we said good-bye to everyone and again boarded a sleeper train from Guilin to Guangzhou, this is where things got really interesting. 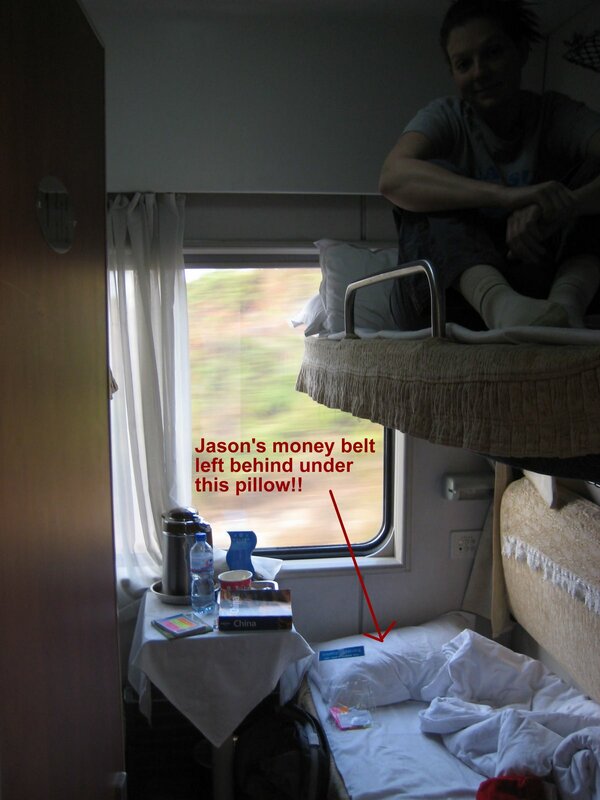 We arrived at the hostel in Guangzhou only to find out that Jason had left his money belt with passport, plane tickets, credit cards, travellers cheques and money under his pillow on the sleeper train!! ARGH!! We returned to the train station and asked the station police to help us out. They sat us down and the one English speaking officer collected our information. The train had carried on to its final destination of Shenzhen and the police were unable to contact the train directly. We had to wait for the train to arrive in Shenzhen before we could find out if the Shenzhen police could recover the money belt. We were alone in our cabin on the train, so our chances were pretty good. Sure enough, after 2 hours of waiting, we got the call that it had been recovered! Yay! The police arranged for the money belt to stay with the officer on that train and for him to bring it back to Guangzhou when the train made its return journey to Guilin. The train didn't come back through until 7:45pm so we had time to check in to our hostel and fret. We returned to the train station before 5pm so that we were there when the police shift changed. We waited until 7:30pm when a police officer took us to the train platform to meet the train. Woo Hoo! The money belt was in out sights but the security officer was reluctant to return it. It took a good half hour before they talked with us and it seemed they weren't going to return it at all. We were able to reproduce Jason's passport number which we had copied down in case of emergency and then they finally checked my signature and all was well. Quite a frustrating adventure. Not one that we plan to have happen again! It's funny, they made us count the Chinese money in the belt twice to ensure it was all there. We couldn't have cared less, we just wanted the passport back. Money is so important here. We celebrated with ice cream and beer :). After the ordeal, we changed our original plans and decided not to tour Guangzhou or stop in Shenzhen, missing out on two very tall buildings. Jason compromised with himself and decided that from now on, only buildings over 400 meters tall were worth visiting. This excludes Guangzhou and Shenzhen. Instead, we relaxed in our room for the evening, finishing season 2 of 24 and spent this morning finalizing hostels and plans for Hong Kong and Taiwan. Susy and Tim promised blue skies in Hong Kong but the sun was already out in Guangzhou and has continued to shine all the way to Hong Kong. We're looking forward to the beaches in Hong Kong and camping in Taiwan. Only 9 days till Christmas - Season's Greetings!